Indonesia’s Mount Agung has played a game of will it/won’t it erupt for months with swarms of earthquakes and occasional ash plumes. That game ratcheted up a notch this weekend when much larger ash cloud shot into the atmosphere and lava made its way to the surface. The dual-colored plume of ash rose up to 30,000 feet into the sky, making for spectacular images, but scientists are still gathering data to see if it will lead to something bigger. If the volcano does become more active, it could do more than cancel flights and incinerate rainforests. It could give the world a brief reprieve from the planetary heat wave of global warming. The big question is if this weekend’s eruption is a precursor to something on the level of the 1963 eruption that killed 1,000 or if the volcano will lapse back into brooding over the idyllic Balinese landscape. 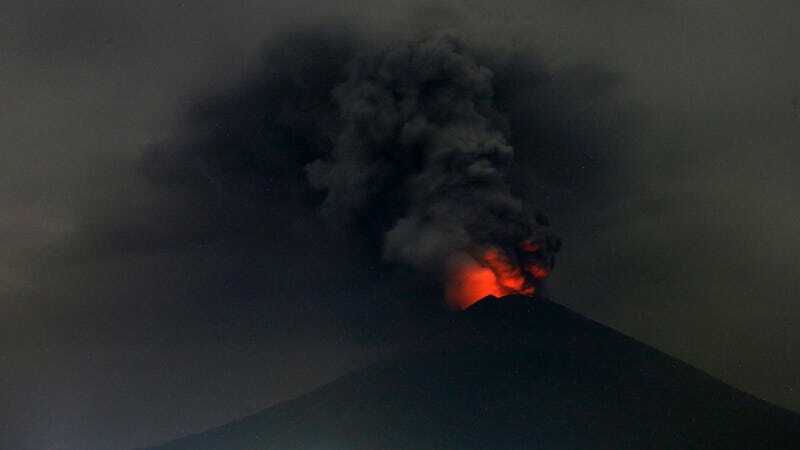 At the moment, Indonesia’s Center for Volcanology and Geological Hazard Mitigation has raised its warning level to red, its highest alert, and evacuated more than 75,000 people living in the volcano’s shadow. “[It’s] wait and see if it leads to more intense explosive eruptions,” Erik Klemetti, a volcanologist at Denison University, told Earther. If it proceeds to a major eruption (and please remember that’s a big if), the effects on the climate could be fairly substantial. Explosive volcanic eruptions can send ash plumes high into the stratosphere. In the immediate vicinity, the ash can fall back from the sky and cause breathing problems or dangerous mud flows if it mixes with rain. But tiny particles of sulfur dioxide in the plume can also linger in the stratosphere. There, they reflect sunlight back into space and cool the climate for a few years before falling back to Earth. Large eruptions can also slow other aspects of climate change. Research published last year shows that the 1991 eruption of Mount Pinatubo in the Philippines cooled the oceans enough to momentarily depress sea level rise rates. But all of these impacts depend on sulphur dioxide reaching the stratosphere. While satellites have shown sulphur dioxide in Agung’s ash cloud, the cloud is only about halfway to the stratosphere at this point. That means its climate impact is negligible so far. But if the ash cloud rises higher and becomes more potent, its climate impacts would be felt fairly quickly. Hausfather conducted an analysis of what a 1963-level eruption would mean for the global average temperature. It shows that the planet would likely cool 0.1-0.2 degrees Celsius with the peak cool period coming around 2019. A weak La Niña that’s expected to last into the spring of next year could have also have a limited chilling effect on the planet. Of course, “cool” is used relatively. In Hausfather’s analysis, 2019 would be the coolest of the post-Agung eruption years, but it would still rank as one of the five warmest years on record. That’s because Agung’s sulphur dioxide is far outweighed by the warming influence of all the carbon dioxide humans have added to the atmosphere. It’s like dropping an ice cube into a pot of water boiling on the stove. Now if the volcano under Yellowstone decides to erupt, that’s another story. But don’t get your hopes up.